The latest public release of Solid Framework SDK is now available for download from the developer portal at www.solidframework.net. This is version 9.2.8681. During routine testing of our large PDF collection, it was found a very small number were no longer able to be converted. This affected approximately 1 PDF in 100,000. This release resolves the issue. There are no other changes from version 9.2.8680. The latest public release of Solid Framework SDK is now available for download from the developer portal at www.solidframework.net. This is version 9.2.8680. PowerPoint and Word both support multiple layers of content, with those on top potentially obscuring those beneath. In some situations the order of these layers was incorrect, resulting in text or other items on the page being “lost”. This problem has been resolved for a number of samples which exhibited this problem. Improvements have been made in beingh more consistent with font types and styles to provide a more aesthetic document. A number of parameters that used obscure numbers now use Enums instead. This is aimed at improving long term maintainability of code but may cause compile time errors. This affects PagesModel and PdfDocument classes only. The latest public release of Solid Framework SDK is now available for download from the developer portal at www.solidframework.net. This is version 9.2.8564. TextRecoveryLanguage is used to specify the language of the document that needs to have text recovered by OCR when creating a CoreModel. Previously this was always set to “english”. It now defaults to “automatic”. For non-English documents this option will now allow the same result to be created whether conversion is performed using the “Converter” classes or the CoreModel. If a table is split over multiple pages within the PDF then an attempt is made to stitch these back together into a single table. We have resolved issues that prevented some tables from merging correctly. Several issues associated with reconstruction of Chines Language files have been resolved. KeepNonTableContent has been created as an alias for TablesFromContent. 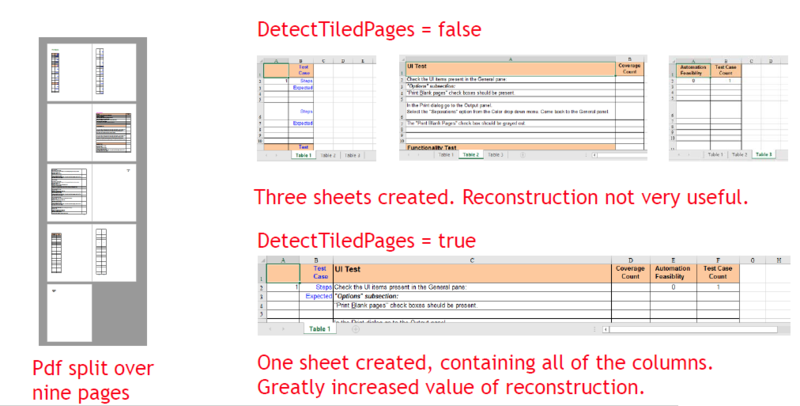 The option specifies how non-table text and images within a PDF should be handled when reconstructing Excel documents. The name TableFromContent does not clearly identify what the option does. It has therefore been deprecated and users are advised ot use “KeepNonTableContent” instead. The latest public release of Solid Framework SDK is now available for download from the developer portal at www.solidframework.net. This is version 9.2.8492. We have created a new Option “PreserveColumnsInNonTableContent”. If this is true (the default) then non-table content will be retained in columns when exporting to Excel. This will make the reconstructed spreadsheet look similar to the PDF. If it is false then non-table content will be placed in the first column, with one paragraph per row. The default value is different from previous version of Solid Framework. This will result in a different, but more faithful reconstruction. This option is only meaningful if TablesFromContent is true. Note: in 8472 we implemented this mechanism by making TablesFromContent an enum. However, this could cause compile time issues for our customers, and therefore we have reverted to the previous mechanism. SaveProgress and other, similar, events have been available within the .Net version of Solid Framework for a long time. We have now made the same functionality available within the native C++ version of Solid Framework. The latest public release of Solid Framework SDK is now available for download from the developer portal at www.solidframework.net. This is version 9.2.8472. Additional columns were created when converting some PDFs to Excel. This made editing difficult. Solid Framework 9.2.8472. no longer creates such columns. If a PDF contains an image larger than than the maximum row height in Excel (409 pt) then previously it has been discarded. In this release additional rows will be added to allow the image to be shown. SolidOCR continues to improve, and this release contains further refinements. In particular, in this release we have made improvements with regard to very small text. Solid Framework has supported tags within PDF documents for many years. Tags are used to guide the reconstruction process, particularly with regard to identifying tables. This can result in visually similar PDFs being reconstructed differently depending on whether or not they are tagged. We have now added the option DetectTaggedTables (default = true). If the option is set to false then the tags will be ignored when reconstructing the document. When creating an Excel spreadsheet from a PDF, we have always offered a choice as to how text that is not part of a table should be handled. In the past the only options have been to either remove it, or to place it into the first column of the spreadsheet, with one sentence per row. We have now added the option of “KeepColumns” which will respect the horizontal location of text. This option allows the spreadsheet to look more like the original PDF. For more information see the blog note. This improvement has required ExcelTablesFromContent to be changed from Boolean to an enum. This may cause compile-time errors in existing code. Please contact us if you require support. We recommend choosing the “.docx” file format when converting to Word, as this has been the default format for more than ten years. We have, however, also supported conversion to “.rtf “and to “.doc”. While we will be continuing support for “.rtf”, from this release, conversion to “.doc” will actually result in creation of a “.rtf” file with only the file extension being “.doc”. Such files will still open seamlessly in Word. The latest public release of Solid Framework SDK is now available for download from the developer portal at www.solidframework.net. This is version 9.2.8284. The rendering and conversion of Type 3 and Type 7 shading has been significantly improved. Previously red numeric text was always considered to represent negative numbers. It is now considered to be negative only if it is preceded by a “-” sign. SolidOCR continues to improve, and this release contains further refinements. In this release we have made improvements in the recognition of bold text within documents as well as specific improvements within the 32 bit version of the Framework. Solid Framework has supported tags within PDF documents for many years. Tags are used to guide the reconstruction process, which can result in visually similar PDFs being reconstructed differently depending on whether or not they are tagged. We have now added functionality to allow tags to be removed if required.